Mark Middlebrook used to be an engineer but gave it up when he discovered that he couldn’t handle a real job. He is now principal of Daedalus Consulting, an independent CAD and computer consulting company in Oakland, California. (In case you wondered, Daedalus was the guy in ancient Greek legend who built the labyrinth on Crete. Mark named his company after Daedalus before he realized that few of his clients would be able to pronounce it and even fewer spell it.) Mark is also a contributing editor for Cadalyst magazine and Webmaster of markcad.com. When he’s not busy being a cad, Mark sells and writes about wine for Paul Marcus Wines in Oakland. He also teaches literature and philosophy classes at St. Mary’s College of California — hence “Daedalus.” AutoCAD 2006 For Dummies is his eighth book on AutoCAD. David Byrnes is one of those grizzled old-timers you’ll find mentioned every so often in AutoCAD 2006 For Dummies. He began his drafting career on the boards in 1979 and discovered computer-assisted doodling shortly thereafter. He first learned AutoCAD with version 1.4, around the time when personal computers switched from steam to diesel power. Dave is based in Vancouver, British Columbia, and has been an AutoCAD consultant and trainer for fifteen years. Dave is a contributing editor for Cadalyst magazine and has been a contributing author to ten books on AutoCAD. He teaches AutoCAD and other computer graphics applications at Emily Carr Institute of Art + Design and British Columbia Institute of Technology in Vancouver. 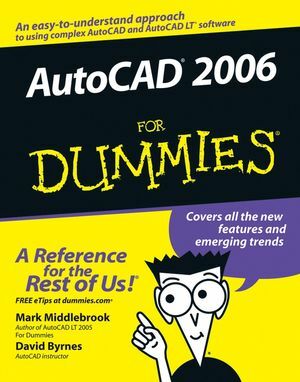 Dave has tech edited six AutoCAD For Dummies titles. AutoCAD 2006 For Dummies is his first chance to make his own errors. Chapter 2: Le Tour de AutoCAD 2006.